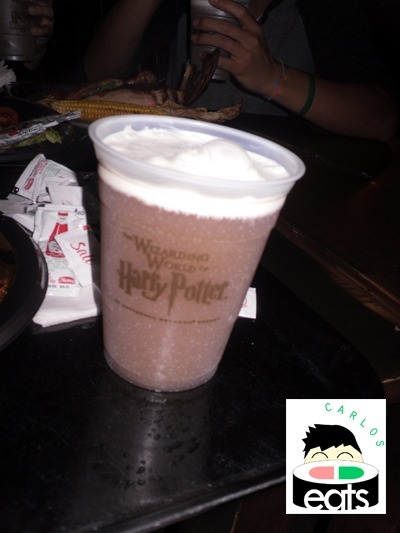 In honor of the release of Harry Potter and the Deathly Hallows Part II’s release, I thought I’d do a write up on my first experience with Butterbeer (read my review Harry Potter and the Deathly Hallow’s Part II here). 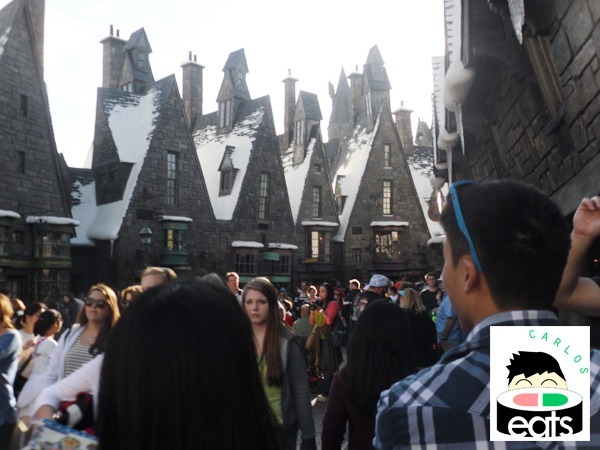 One of the most exciting parts of visiting Universal Studios earlier this year was visiting the Wizarding World of Harry Potter. One minute in this new land and we felt like we had left Universal Studios. Every detail was made to feel like a realistic representation of the Harry Potter franchise. You can read more about the park on my travel blog Carlos Abroad. We really wanted to try the Butterbeer that everyone was raving about. There were stands around the park where you could line-up to buy some, but my friend suggested we visit the Three Broomsticks restaurant and avoid the lines. This strategy proved successful and within minutes we were ordering food and picking up our Butterbeer. There were two kinds of Butterbeer and I decided to go with the frozen Butterbeer (my theme park guru friend recommended it), in addition to a turkey leg combo with fry wedges. 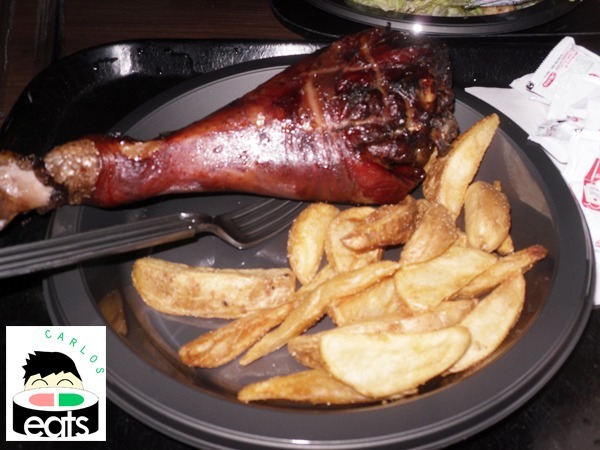 The food was surprisingly good for theme park food and although I would have enjoyed some bbq sauce with my turkey leg, I was full within a few minutes. My friends didn’t hesitate to devour every last piece of my turkey leg I was unable to finish. The potato wedges were tasty as well. This interior of Three Broomsticks will remind you of a tavern you might find within the world of Harry Potter. There is a stairwell that seems to go up to higher floors, but it is all for show. The frozen Butterbeer was sweet and tasty. It was sweet without being too strong. You’ll notice that almost everyone around you orders Butterbeer as well. There were elements that made me think of a butterscotch-like root beer float. 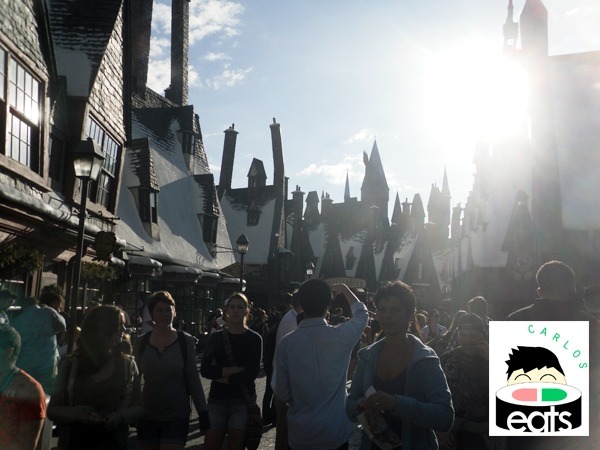 It was definitely one of the most exciting parts of visiting the Wizarding World of Harry Potter and something we HAD to do before left. No questions about that. I think everyone should give it a shot. ooooooooo exciting! i’m going next week. gotta hit dat butterbeer! GOD IT WAS SO GOOD!!! i want more. =D I need to have some more before I leave town! Fan of the regular butter beer here, but next time we go we’ll give some love to the frozen kind.